This year is officially the year that I lost my MAC mojo, whether it's down to an overload of make up in general or the fact that it's almost impossible to keep up with the numerous releases, I can count the number of MAC items I've purchased or acquired this year on one hand. A lot of the collections have been very samey, and although I've had to sit on my hands big style to stop myself ordering Light Years MSF from the Heavenly Creatures collection not much has really screamed buy me this year. However one product I received as a gift earlier this year has already cemented a special place in my heart. 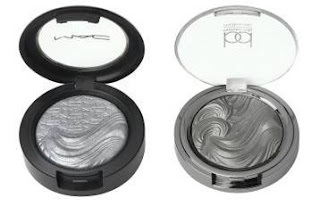 MAC Modern Pewter eyeshadow from the Extra Dimension collection. We'll start off with the appearance - how amazing do these shadows look ?, with the MAC embossing and the wave design, they are almost too pretty to use. It so easy to wear on it own, when I'm having a lazy day but want a little bit of an impact. These shadows can be worn dry as I've shown here or they can be used wet for even more of an impact. I really love this shadow, and I really wish that I'd picked up a few more colours from the collection when it was available but alas at £16.50 each I couldn't really afford it. Imagine my intrigue and delight though when I received a press release regarding a product in the acclaimed BD Barbara Daly Make Up line at Tesco - Spot the difference? 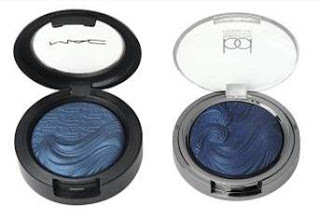 OK there not identical but they look pretty similar to me, and guess what the BD Satin Swirls were released at least 6 months before the MAC alternatives. They are available in 10 fabulous shades and promise a silky smooth satin finish and texture. I was kindly sent one of the BD Barbara Daly Make Up Satin Swirl Eyes in Cinder Shine to try out. 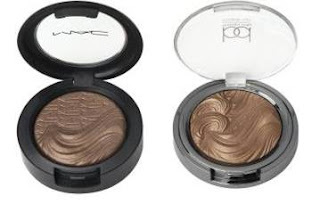 On appearance they do look quite similar, the BD shadows feature an all over 3D swirled design, where as the MAC shadows as well as the swirls features a smooth area with an embossed logo design. The BD Satin Swirl shadow feels very soft but it's perhaps not quite as creamy as the MAC alternative. Never the less it's still very pigmented and it gives super smooth, even coverage on the lids. Cinder Shine as you would expect is a dark smoky grey shade, it's has a lot of silver in it though and quite a metallic finish. IHih it's because they've both been produced in italy by an italian multinational. Those type of shadows have been requested so much by different companies. They are amazing. And they can be worn wet or dry. They look really lovely - I shall look out for the next time I'm in Tesco's!